l Hill Air Force Base is an Air Force Materiel Command base located in northern Utah. Hill is home to many operational and support missions, with the Ogden Air Logistics Center (OO-ALC) serving as the host organization. The center provides worldwide engineering and logistics management for the F-16 Fighting Falcon, A-10 Thunderbolt II, Minuteman III and Peacekeeper intercontinental ballistic missiles. The base performs depot maintenance of the F-16, A-10 and C-130 Hercules aircraft. The center is responsible for Air Force-wide item management, depot-level overhaul and repair for all types of landing gear, aircraft wheels, brakes and tires. The logistics for all conventional air munitions, solid propellants and explosive devices used throughout the Air Force are managed at Hill AFB. The center is the Air Force Center of Industrial and Technical Excellence (CITE) for low-observable ('stealth') aircraft structural composite materials and provides support for the B-2 Spirit multi-role bomber. A full range of sustainment and logistics support is provided for space and command, control, communication and intelligence systems. The center provides worldwide logistical support for mature (T-37, T-38) and proven (F-4, F-5, F-111, OV-10) aircraft. Hill is also responsible for providing photonics imaging and reconnaissance equipment; aircraft and missile crew training devices; avionic, hydraulic, pneudraulic and radar components; instruments; gas turbine engines; power equipment systems; special purpose vehicles; shelters; and software engineering, development and support. The Ogden Air Logistics Center, the largest unit at Hill Air Force Base, has as its primary mission maintenance of F-16s, the nation's largest fleet of fighters. Hill Air Force Base is the largest employer in Utah, with nearly 24,000 workers. l CLOVER CONTROL: Provides air traffic control services within the Utah Test and Training Range complex. Ogden ALC is part of Hill AFB, UT, which seems to have some kind of connection to Groom Lake. Ogden uses the tail code "HAFB" for fixed-wing planes. Please let us know if you see any planes with that tail code in the Groom Area. Note the four letter code, as opposed to the usual two letter tail codes (like HI and HL for other units of Hill AFB). 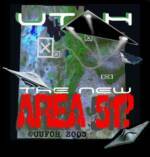 (Hill Air Force Base, UT) -- A new plane is in the air over Hill Air Force Base. It's the FA-22, and it is the Air Force's newest fighter plane. Hill is the first base in the country to get the planes, and they'll be here for two weeks before launching a tour of other bases which specialize in advanced fighters. Lieutenant Colonel Jim Hecker says the planes will fly with conventional F-16s to help smooth training and let the pilots get familiar with both the capabilities of the planes and the conditions of local airspace. They'll spend most of their time over the West Desert, but the two weeks will also be important for the mechanics and other support personnel who go with the new planes. l Is Hill too good to die? The FA-22 Raptor, which is planned to replace the F-15, will be go "through the wringer" at the Utah Test and Training Range beginning this weekend. Officials said it will see action beginning next year.